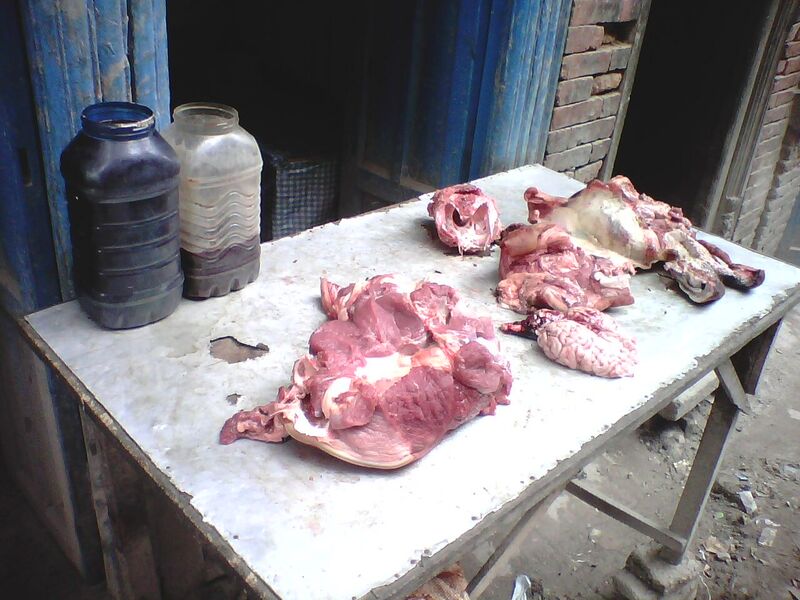 When I walked down the street and saw pig heads and blood sitting on tables open to flies and dirt, I decided to eat vegetarian. I just didn't think too much of the way I saw food cared for here in Nepal. I just ignore meat. Do I miss it? Sometimes. Especially since apartments don't come equipped with ovens, cooking can become a bit dull. Eating in Nepal is just different. For example, this picture of me below is one of the best places to find a samosa in Kathmandu. Never mind that you have to stand up to eat it; it's worth it. There is a sink for washing hands and some cocktail type tables attached to a couple of the walls inside, but it's just plain rough. 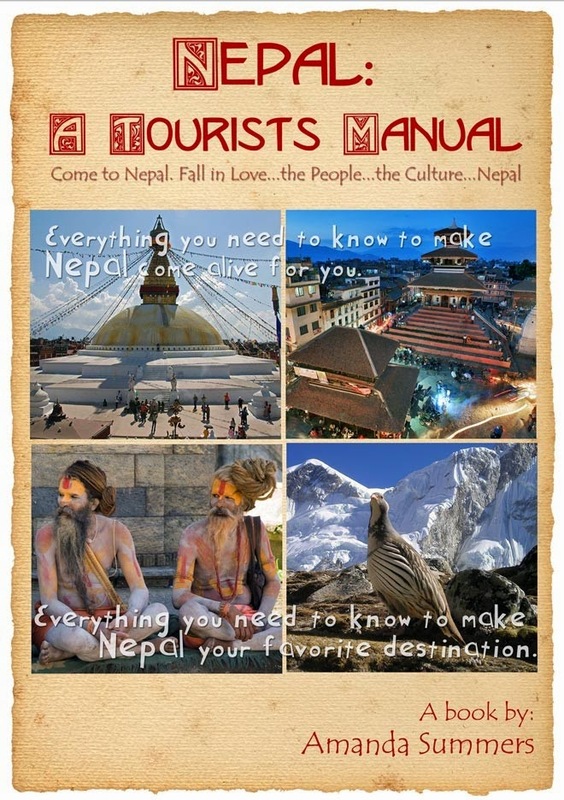 This is the same favorite place I talk about in my book, Nepal On A Budget. There isn't even a sign outside. Just look for Tip Top Tailors while you are in the New Road area (very close to the Peanuts building) and go into the alley behind it. It's amazing! You can also get a great selection of Nepali sweets there, too. Here is another one of my favorite places to eat. This one is next to the Tourist Information Center and Tourist Police office in the Ratna park area. It's amazing. Two people can eat for about 100 NRs. That would include rotis, rajma (bowl of delicious bean soup) pickle and milk tea. It's served fast and hot. It isn't very hygienic but I've never had a problem there. Go at meal time and enjoy. Just sit where you can find a seat and the boy will come over to take your order. You can have them prepare something, but I think it's safer at places like this to eat whatever is fresh and hot. Really, this is a great place to eat when you are in the mood for it. Some days I am just not up to seeing people wipe with a rag that is dirtier than the table. But life on the planet is shared with many bacteria and most are harmless. So, back to the meat issue. 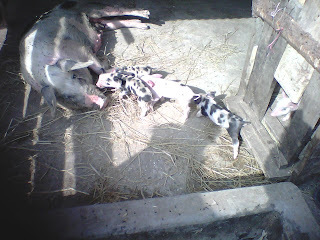 Living in Bhaktapur, one day I saw a pig farm and had to stop to check it out. Why? Because if I hadn't looked over to see a pig I wouldn't have known I passed a pig farm-no odor at all. I was so impressed I almost went back to eating meat. Imagine a clean pig farm! Isn't this impressive? They were just so happy at this farm. I'm in a third world country and the pig farms are cleaner than back home. I walk past a chicken house every day on my way to the old city of Bhaktapur and I didn't even know there were chickens there, they were so quiet and little to no odor. So, on the one hand, Nepal is a third world country where westerners need to take a few extra precautions to keep from getting ill, but on the other hand the way some things are done are an improvement over the west. It's a country of opposites.